It did take me a good 15 minutes to locate Block 263 Serangoon Central Drive. 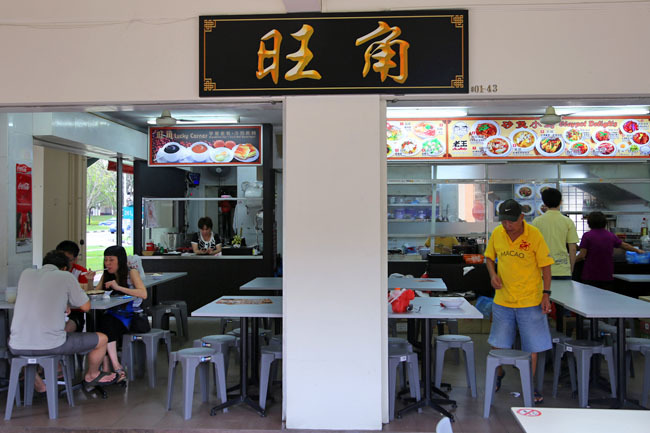 After I found it, I came to realize the corner coffeeshop at the ‘backside’ was actually just about 5-10 minutes’ walk from Serangoon NEX, with a signboard displaying “Wang Jiao”, housing one of the most known claypot stall in this district. When I saw the menu display, I thought many of these dishes were homely and unassuming. It was like what some grandmothers would have cooked for family dinners such as Claypot Sesame Chicken ($4.50), Frog Leg Herbal Soup ($8), Ginger and Spring Onion Pig Organs ($4.50), Gong Bao Frog Legs ($7), and Spicy Pig Trotters ($4.50). Yet cheaper than the usual zi char fare, the price point seems attractive. The Sesame Oil Chicken ($4.50, $6.50 for larger portion) was the highly recommended dish from the auntie Ah Ping who was manning the stall. 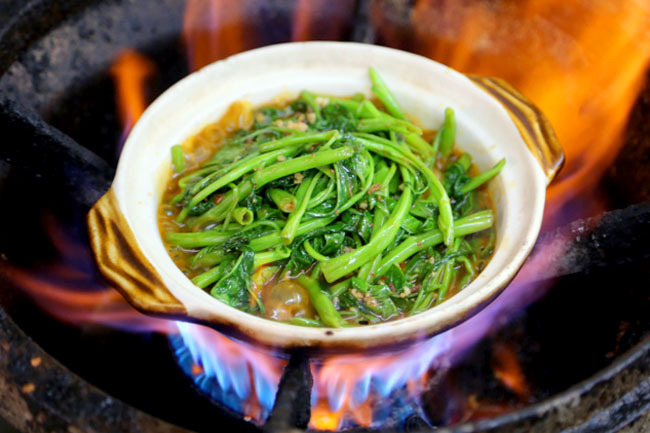 “Zui hao mai de!” The claypot came piping hot, the salty gooey sauce bubbling as it arrives on the table with a faint fragrance of sesame oil. I went straight for the sauce to top with the rice, and the chicken thigh meat tender and succulent. Best thing I discovered – no bones. First time I could eat this humble (confinement) dish without dirtying the hands. 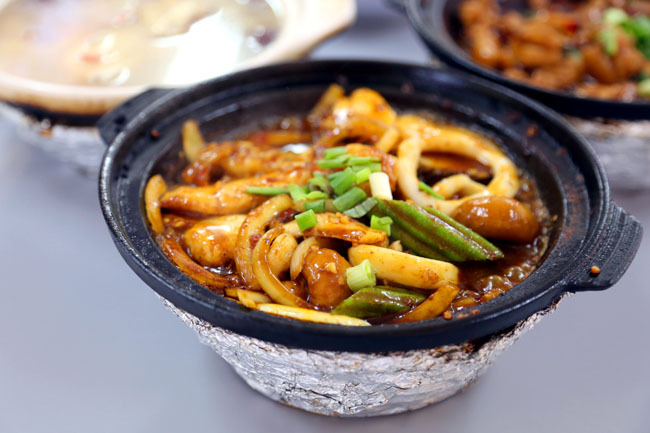 Personally, I would recommend the Claypot Spicy Sambal Seafood ($6.50). This is off the regular menu, but Ah Ping told me to order so. You get generous portions of fish slice, sotong, prawns and ladies’ finger (am I one of the rare ones who love ladies’ finger?) drenched in this sauce which reminded me of gong bao and soy sauce chicken sauce. Even after having a few spoonfuls, I didn’t feel the need to drink plenty of water. But don’t finish the ‘zup’ lah – quite oily. 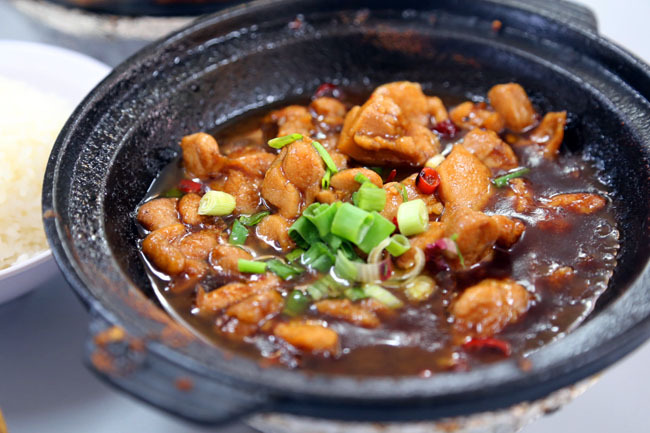 If ‘zup-zup’ (saucey) is not your kind of thing, try the Claypot Herbal Frog Leg ($8) or Fish Soup ($5) which is refreshing after a few heavy dishes. 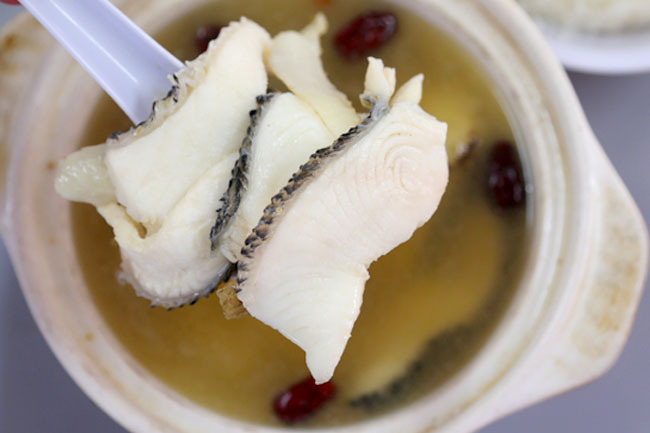 The soup came with many slices of fish (they are really not stingy about it), felt very light and not overly intense. I did wish it was more ‘bu’ (nutritious) with a stronger herbal taste. I will say “Yes” to the Sambal Kang Kong ($4.00) as well. 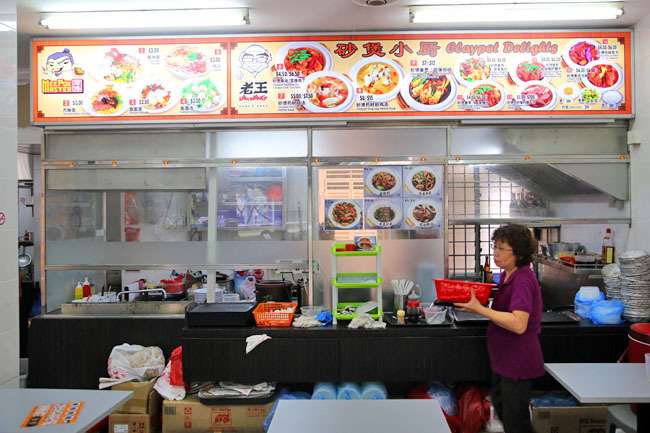 The little Wang Jiao Coffeeshop also contains a Mee Pok Master stall selling Teochew noodles and laksa, and another selling kopi and toast. 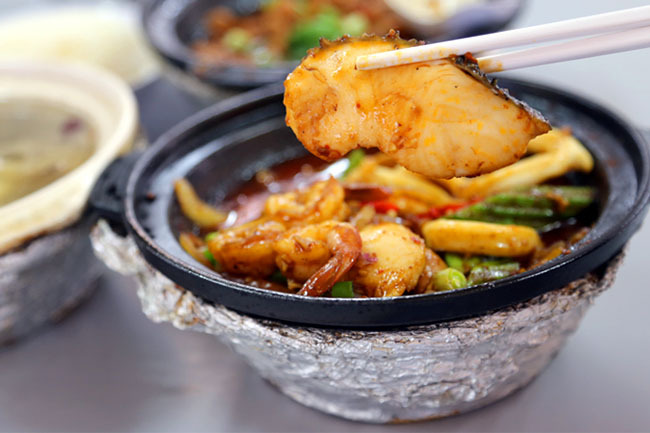 If you are at NEX and want to experience value-for-money tasty claypot dishes for the family, Lau Wang is just a short walk away.